Hello! This is the Doomed Show is back once again (third week in a row!). 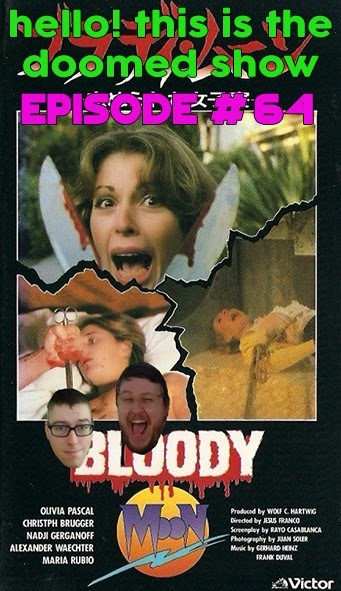 Jeffrey and I talk about Bloody Moon from good old Jess Franco. We have more fun than is humanly possible talking about a really fun movie. You should listen right now. Listen to the Bloody Moon episode here. Or download it here. Hell yes. Right on! Right on! I get all extra-excited when it's gonna be about a film I actually know. Which is almost never. And a Franco, no less! Very cool, looking forward to give it a listen! Btw, the German title translates to "The Saw of Death" which is more prosaic, but still pretty cool. Wasn't this a German co-production? It actually was (perhaps still is) banned here, I think, and all German home video releases are cut for violence (and low-budget weirdness I guess).